Graduation parties aren't complete without a little something sweet. Forgo the traditional sheet cake and serve graduation themed cupcakes that are sure to make the graduates and their guests smile. Roll yellow fondant and cut out a topper using a round cutter with scalloped edge. Write your Congratulations message with royal icing on the fondant piece and allow to set up. Use rolled black fondant to create the mortarboard and yellow fondant for the tassel. Roll white fondant into the shape of a diploma and wrap thin pieces of red fondant around it. Allow the two fondant pieces to dry just a little and then affix to the top of the cupcake with royal icing. Tint buttercream frosting with pastel shades of green, yellow, purple, orange, and turquoise so they match the colors on the book cover. Fill piping bags with each color and attach round tips of varying sizes. Using the largest tip and circle the top of the cupcake. Smooth out the top with a spatula. Then follow suit with each tip, moving to smaller sizes as needed, until you finish the layered frosting look. Skip topping the cupcake with a graduation decoration -- turn the entire cupcake into the decoration! These are easy and perfect for someone who wants a neat design without a lot of effort. Buy chocolate-covered graham cracker squares or square chocolate-coated cookies. Add a small, colorful candy-coated chocolate to the top using royal icing as your adhesive. This creates the cap. While the candy piece dries, flip your (unwrapped) cupcakes upside down. Attach the cap to the cupcake with royal icing. Add a food-safe tassel decoration to complete the graduation cap design. Roll golden yellow fondant and use cutters or number punches to cut the graduation year out. Dust with edible gold luster dust until the desired sheen is achieved; alternatively, use an airbrush to give it a metallic quality. Sprinkle edible gold stars over buttercream-topped cupcakes. Carefully place your golden graduation year decoration on top. Everyone's smiling at graduation, so go ahead and make cupcakes to match. These cookies 'n cream cupcakes utilize popular smiley faces in their design. Crush chocolate sandwich cookies over buttercream-frosted cupcakes. Roll yellow fondant and cut round faces. Using edible markers, draw smiley faces onto the fondant and allow them to dry. Roll black fondant and use an impression roller to create a design. Roll and shape tassels out of gold or gold-dusted fondant and affix to the mortarboard with royal icing. Set a whole chocolate sandwich cookie on top of the buttercream cupcake. Add the fondant face, then use royal icing to adhere the mortarboard to the top of the face. Roll fondant in your graduation colors and use a star cutter to cut the shapes. Use a serrated wheel fondant tool to make the design around the stars' edges, approximately 1/8" in from the edge. Use number punches or cutters to create the year and affix to the top of the star with royal icing. Place the star on top of a buttercream-frosted cupcake. Place a small dark round candy, like a chocolate-coated mint or black jaw breaker, in the center of a buttercream-frosted cupcake. Unwrap a small individual square of chocolate. Cut a piece of licorice into small strips, leaving them attached at the very top. Affix to the center of the square candy using royal icing to create the tassel. 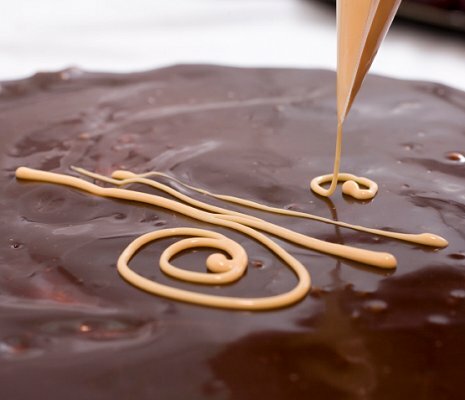 Add a dab of royal icing on the bottom of the chocolate piece and place it slightly askew on top of the round candy. Buttercream frosting is a favorite for many grads and their guests, so don't obscure the flavor by adding candy or fondant. Instead, make these easy initial cupcakes and let the sweet flavor shine. Frost cupcakes with your best buttercream frosting, tinted to match one of your school colors. Allow the frosting to set up for a few minutes. Add white, black, or another school color to a piping bag with a small round tip. Carefully pipe your initials in the center of the cupcake. Add small dots around your initials. Sprinkle a few silver dragees on the cupcakes to finish them. Make cupcakes that let your guests know you're now a "wise old owl." These are especially fun for an owl or outdoor-themed graduation party for elementary students. Dip mini pretzels in melted white almond bark and allow them to set. While you're waiting, frost cupcakes in your choice of frosting. Once set, place pretzels on the cupcakes, pressing into the frosting to make them stick. Leave a space at the top for the cap. Add blue coated candies for eyes and small pieces of pink fondant for the nose and eyebrows. Carefully add sprinkles to the center forehead of the owl. Add a small piece of colored fondant to the top of a wrapped candy with pleated sides using royal icing. Match the wrapper color to the fondant tint for a coordinated look. Once the cap is secure, press it into the top of the cupcake to create the mortarboard. Even if you're all thumbs in the kitchen, you can still create great graduation cupcakes. Purchase mortarboard picks and place them in the cupcakes. Add a small pennant or banner pick in your school colors to match the wrappers. Finally, put them on a cupcake stand or decorated cupcake tower to create a display that pops. Cupcakes are a delicious alternative to traditional sheet cakes. Don't feel like you have to skip the cake decorations just because you're going with a smaller dessert; just make the decorations fit the cupcake's size and everyone will be raving about how smart the graduate is in both studies and snacks!